September 18, 2013 my wife, daughter and I saw the Wiggles in concert at the Peabody Opera House in St. Louis, Missouri. I retired from concert-going in 1992. My hearing was shot even then and with a screeching baby the tinnitus has not gotten better. Going to concerts would rip apart what was left of my hearing, as well as rip apart what was left of my bank account. Five hundred bucks to see the Eagles? I can hear them for free every time I turn on the radio. Every. Time. Not even if they performed in my front room. I came out of retirement three times – once to see Ringo Starr do a free concert under the St. Louis Arch on July 4thin the late nineties (a Beatle for free? Yes, I will come out of retirement to see a Beatle for free…), once last year to see Rik Emmett ($10.00, yes, I will come out of retirement to hear Triumph’s Greatest Hits live for $10.00), and now to take my daughter to see the Wiggles. 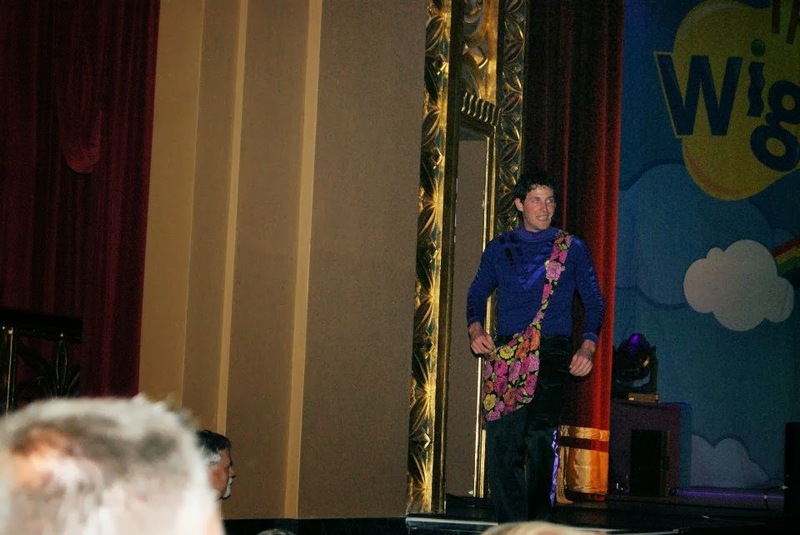 This was the tour supporting their DVD “Taking Off” and was the first “solo” tour of the new Wiggles. Founders Jeff, Murray and Greg retired. 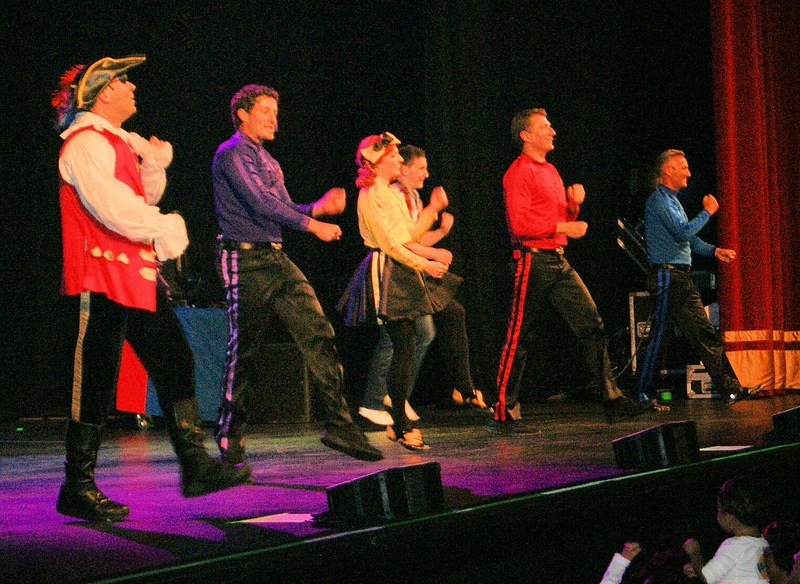 Anthony continued with three new Wiggles – although all of them were with the franchise either playing secondary characters or back-up singers and dancers. The new members were Simon, Lachy and Emma. It was quite a controversy when the new Wiggles took over, but most of their world-wide fans wished them the best when the shock wore off. My daughter discovered the Wiggles early in 2013. To her mind, Emma is as much a Wiggle as Greg. Or Sam for that matter. She adores Emma. She is her favorite. So of course she wanted to dress like Emma for the show. Easy enough – she already has a black skirt, black leggings and a yellow shirt. She looks good in yellow, with her dark skin. My wife has always been happy about that. I was afraid I would be the only adult male at the show. I wasn’t. I was afraid I would be the oldest father there. Surprisingly, I wasn’t. In fact, most of the fathers I saw there were about my age. Some of them had children younger than mine (this concert was her fourth birthday present). 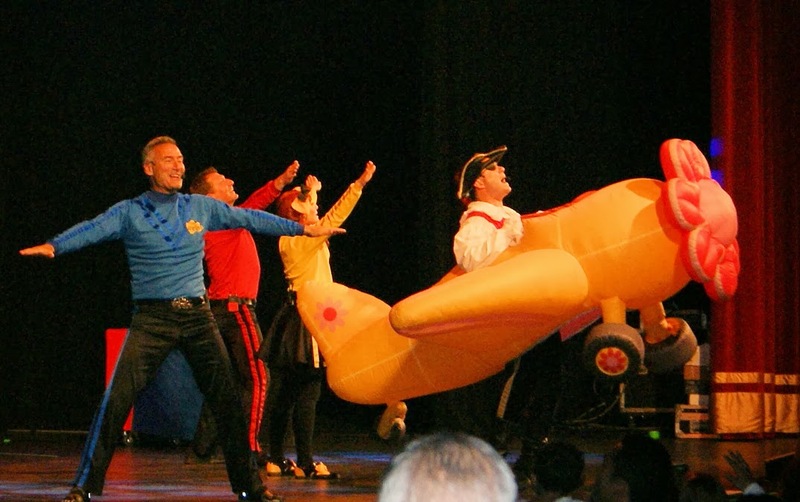 The stage cast consisted of Anthony, Emma, Lachy, Simon and Paul Paddick as Captain Feathersword along with three back-up dancers and singers. They would take turns as the costumed characters of the franchise: Dorothy the Dinosaur, Wags the Dog and Henry the Octopus. They did an excellent job of keeping the pace going so that you never noticed who was missing from the stage when the costumed characters were on. Paddick does the voice for Henry the Octopus. I didn’t notice if he was on-stage or off-stage while Henry was “singing” his song. He may have been IN the costume for all I know. So there were no elaborate sets depicting Wiggle Town or the Wiggle House, no 12-foot blow-up Wiggles, no working Big Red Car. The backdrop was a replica of the cover of their new DVD that set behind a drum kit and keyboards and guitars. The only props were a cardboard castle set in front of a tall stand as well as a camel and airplane costume – each worn by Captain Feathersword. Sparse settings made sense, though. Who knows how successful this tour would be? Who wants to spend millions on setting up, tearing down and moving elaborate sets for half-filled stadiums? They needn’t have worried. They went for smaller venues and all of them are sold out. I checked the tour venues online and there were only forty or so seats remaining in each venue for the rest of the tour. All but forty seats available for a 3,500-seat venue (at least for Peabody)? I’d say that’s pretty good. I checked and checked online for a set list for this tour with little luck. The only review I found was on a blog of a Detroit mother. I thought I would do a set list and review the show. By the time this post gets to most of my readers the tour will be over, of course. But perhaps if they tour next year (or more likely the year after) this will give parents who know nothing of Wiggle concerts a taste of what to expect. I spent most of my time talking photos, writing down names of songs and smiling at a squealing and giggling three-year-old. Near the end of the show, my daughter and two others were on the far left aisle dancing. I had to warn my daughter not to flail around too much for fear of hurting the other children. The mother of one of the little girls asked her to stay near. She kept her arm around her daughter at first. She didn’t want her daughter dancing with other girls while some tall, fat, bald man took their pictures. But she soon relented. During the last song my daughter finally took that tumble I warned her about. She cried and I picked her up. It was by now 7:50 and she was very tired. As the Wiggles waved goodbye I told her they were leaving and to say goodbye. She stopped crying immediately – as children of that age do – and shouted goodbye to everyone on stage. Before and after the concert we took pics of the stage. An usher very kindly took a picture of the three of us in front of the stage when the show was done. Although sold-out, by 7:30 quite a few of the ticket-holders left with their sleepy charges. We ended up with only a few people in our Orchestra Left section. This allowed me to stand and take plenty of photos of the performers. Earlier I was afraid to stand too long for fear of blocking the people behind me. One of the few younger fathers sat two rows ahead of me. He wore his hair in high spikes, which blocked most of my camera’s flash. Near the end, as there was no one behind me; I could stand and hold the camera as high as I wished – his light-absorbing head no longer a problem. We had great seats. Well, Peabody Opera House (I still think of it as Keil Opera House – I saw Clapton there in the 1980s) does not have a bad seat; but we had particularly good ones. We were seventh row to the far left. The front rows taper outward. This means there were three rows between us and the far stage left. Lachey spent some time on our side of the audience. He gave my daughter a high-five! 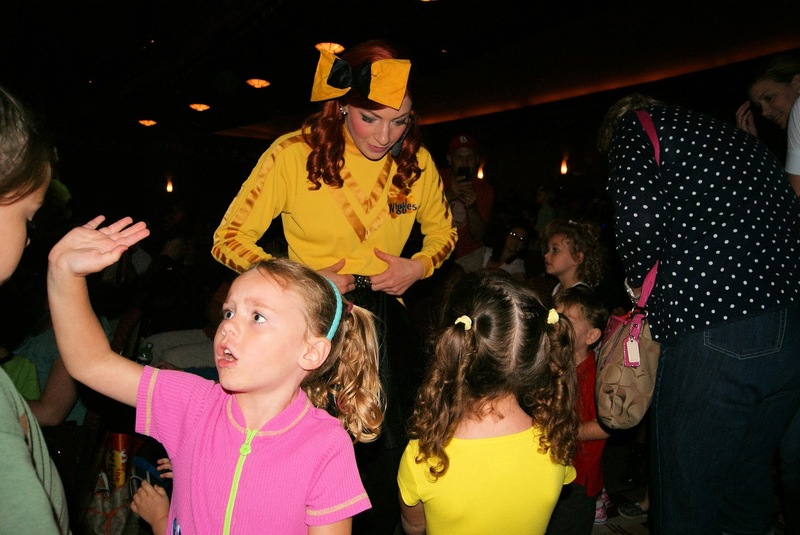 The Wiggles and their troupe sang and played their instruments live. In most of the concert footage they look like they are lip-synching. With all their dancing and activity that isn’t surprising. And this is the Wiggles, not Milli Vanilli – who cares? But we were close enough to tell. They sang live. And their instruments were live, too. Good for them. This despite the fact that there was LOTS of dancing going on. Every song had its own moves. The children (and most adults) followed along faithfully. Captain Feathersword played bass, Anthony played acoustic and electric guitar and drums, Emma played drums, Lachy played keyboards and the glockenspiel. And even the dancers played percussion, drums and guitar as needed. Speaking of the dancers… They were introduced at the end, but by then I was dancing with and photographing my daughter. Looking online doesn’t help identify the three dancers. The beautiful Catarina Mete has a bit of a following and hers is the only name I can find. The other lady is Lauren – I hope the spelling is correct. She was named in a concert segment on the Wiggles’ new TV show. The male dancer, Nick, looks a lot like Lachy; so much so my daughter thought it WAS Lachy when he came on stage. He was the first one on stage. He gave us a safety lecture much like the stewardi on a plane – find your exits, watch your children, that sort of thing. He also told us to tweet what we think about the show and they will later read their favorites during the concert. So spend the concert staring at your phone? Um, no. I disagree – My tweet would read, “I would love to watch the show but I haven’t seen a minute of it because I am trying to tweet.” Don’t text and wiggle. Like I’m one to talk. I spent the concert taking photos and jotting down the playlist. Oh, and I tried keeping a “Gee C’mon” tab, but I lost track among the other things going on. I know Anthony said it two or three times. Emma left the stage for a time to say hello to the fans. Doing my best stage-mother imitation, I grabbed my daughter and walked with her to the center aisle and plopped her in front of Emma. “You’re wearing a yellow skivvie and a black skirt just like mine!” Emma said. My daughter was giddy! She met Emma! Her favorite! I was so happy for her! I knew my daughter was getting tired when she kept asking, “Is it over?” after ever song during the second half. But not in a whiney way, just like asking if a TV show is over. She had a ball. She squealed with delight and laughed and giggled when she recognized a song. By the end, though, she was happy just to dance along with the songs in the side aisles. It made both of us so tremendously happy to see her so happy. There were enough nods to the adults to keep us smiling, too. Captain Feathersword did a funny Cher imitation. Anthony made a Lady Gaga reference. He said, “We used to say Miley Cyrus but we changed that a few weeks ago.” It was funny but I’ll bet he was also very serious. There were comical homages to the songs “The Rose” and “My Sharona”. We might get one last Wiggles concert out of our daughter before she gets too old for that sort of thing and starts dragging us to the boy band dujour. But I’ll cherish the look on her face and the sound of her laugh. Thanks Wiggles!